Police have confirmed that Corporal Albert Roberts, who was severely battered by a civilian, was sent on sick leave. “He suffered bruises and other injuries to his body, and the doctor at the hospital recommended that he be placed on sick leave from the job, so at present I can tell you that he is at home recuperating,” said ASP Gregory Mathurine, Officer in charge of the Community Relations Department of the Royal Grenada Police Force. Meanwhile, Jamie Stewart, the civilian involved in the altercation, was on Friday morning taken to Court on a number charges including assault on a police officer during the course of his duty, resisting arrest, using insulting language, and picking up a passenger in a non prescribed bus stop in the town of St George’s. Mathurine said that Stewart’s decision to pick up a passenger in the heart of the city escalated to the fight. Stewart, who is a conductor on a bus plying the No.1 route, picked up passengers on different occasions in the town. “Corporal Roberts had stopped the bus and informed the conductor that he will be charged for violating the road traffic act, which resulting in Stewart using insulting language to the officer. The officer then decided to arrest him for the offensive language, and it was then that the situation escalated to the point where the officer was beaten up,” he explained. Stewart was restrained with the help of another civilian shortly before a police vehicle arrived. Mathurine said that both Roberts and Stewart were taken to the General Hospital for a routine check because of the injuries to both men. “Roberts was discharged with sick leave, while Stewart was officially charged for the offenses,” said Mathurine, who explained that none of the men were kept overnight at the hospital. The wider public became aware of the matter because several people who witnessed the commotion video recorded the incident and posted it on social media sites Facebook and Youtube, receiving thousands of views. 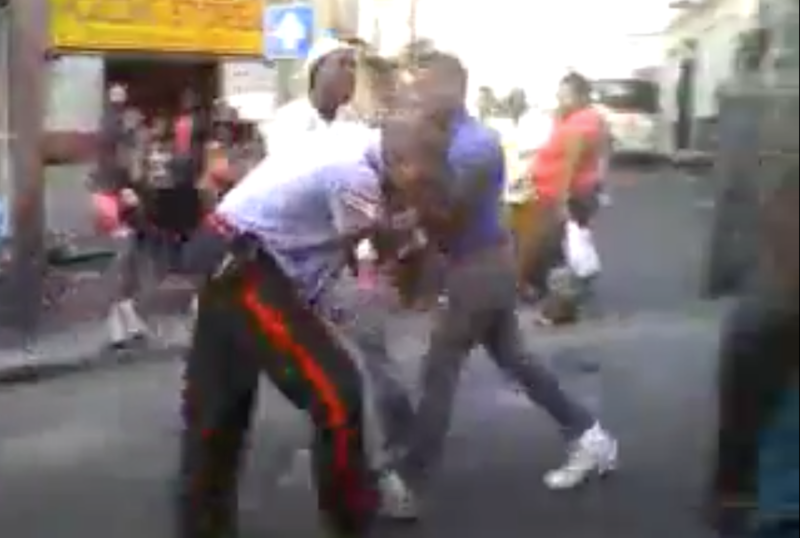 In the video, the police officer is seen holding on to the young man, who was violently fighting the arrest. In the background people are calling on the Stewart to stop his behaviour. “Your father is a police, boy,” said one person.